Having watched the first two hobbit films, I wanted to revisit The Lord of the Rings. All I really remember is that the last film had about seven endings and drove me nuts (especially as, being such a long film, I was desperate for the loo) and that it was all pretty epic. So this, the first one. Wow. It’s everything I remembered. Big, loud, strong, violent, funny at times, full of heart and with both Viggo Mortensen and Orlando Bloom looking more attractive than in anything before or since. So, Frodo (Elijah Wood) has to take the evil ring to the fires of Mordor to destroy it. 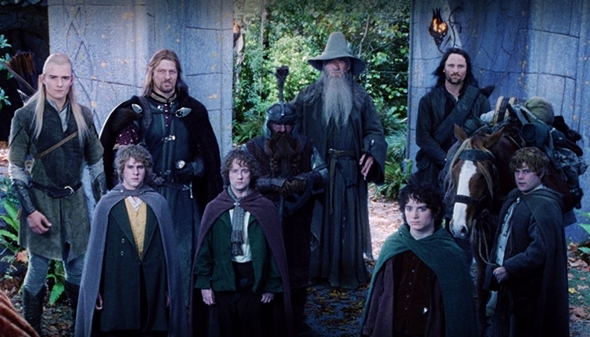 In this film, he joins with a bunch of humans, elves, hobbits and a troll, and (of course) Gandalf (Ian McKellen). I couldn’t recall the whole story, and so it was as exciting as the first time. I’m making this a movie marathon. Wonderful. The Lord of the Rings: The Fellowship of the Ring won Oscars for Best Cinemaography, Best Makeup, Best Music, Original Score and Best Effects, Visual Effects and was nominated for Best Picture, Best Actor in a Supporting Role (Ian McKellen), Best Director (Peter Jackson), Best Writing, Screenplay Based on Material Previously Produced or Published, Best Art Direction – Set Direction, Best Costume Design, Best Film Editing, Best Music, Original Song (May it Be) and Best Sound.